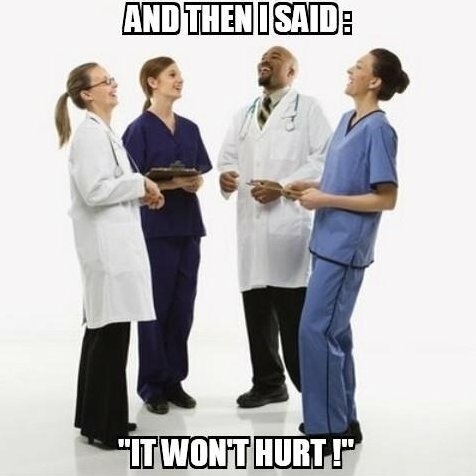 Medical students are taught that pain is the 5th vital sign. Unfortunately, pain is not amenable to objective measurement in the same way as blood pressure, heart rate, respiratory rate, and temperature. All pain is made and modified in the brain, and … is loaded with meaning. Pain is subjective, pain is an opinion. Pain is influenced by your perception of how dangerous or scary a situation is. Your thoughts and emotions can ramp up–or dial down–the intensity of your pain experience. When your doctor says, “This is only going to hurt a little bit,” he is creating a calming context that helps your brain down-regulate the pain experience. An interesting study showed that if you look at your painful hand through a magnifying glass, it will hurt more. Another team of investigators were able to demonstrate how the prick of a needle during injection hurts more if the patient watches the procedure. Only you can determine how much something hurts, but when a doctor tells you that: “This is only going to hurt a little bit,” he is not lying to you. With the correct technique and soothing environment, no modern medical procedure should be excruciatingly painful. If your doctor were to say, “This is going to hurt a lot,” it probably will, because your expectations of painfulness influence the intensity of pain. In our brains, where small details can exaggerate pain, several soothing techniques have been shown to decrease the sensation of pain. Adults and older children undergoing a needle prick, may benefit from the “cough trick”, while Alberta Children’s Hospital uses a performing robot to offer distraction. No-one is suggesting that you will be able to huff, puff, and blow your pain down by using a mystical breathing technique, but you don’t want to create an environment that will hyperbolize a painful experience. You may have heard of the positive power of placebo, but have you heard of the negative nature of the nocebo? I will leave the final word to the following entertaining speaker.